MORE than 850 competitors pulled on their running shoes to take part in the annual Goring 10k. The course record was smashed by 30 seconds as Gareth Watkins, who also broke it last year, after he completed the route in 33 minutes and 14 seconds. It was the first year Mr Watkins, 40, from Hermitage, Thatcham, had raced in the men’s veteran category. He finished 45 seconds ahead of second-placed Lewis Chalk, who won the men’s open crown previously held by Mr Watkins. Kay Walsha, from Dorchester, was the first woman home in 38 minutes and 54 seconds, while the fastest junior female was Abigail Barlow, who clocked a time of one hour and 27 seconds. Ian Middleton was the fastest male junior with a time of 41 minutes and 30 seconds. The men’s super veterans crown went to Jon Cross, with a time of 39 minutes and 45 seconds, and the best women’s super veteran was Jane Davies in 42 minutes and 21 seconds. Jenny O’Connor was the top women’s veteran with a time of 44 minutes and 44 seconds. The men’s masters event was won by Antony Frost, who ran the route in 46 minutes and six seconds and the female equivalent champion was Margaret Moody with a time of 48 minutes and 35 seconds. The fastest runner in the Goring area was Jeremy Waite, who completed the route in a time of 38 minutes and one second. Zac Purchase, who won a silver medal in the lightweight double sculls at London 2012, took part in the race and finished with a time of 47 minutes and 27 seconds. Clive Wiltshire, who co-founded the race in 1997 before handing it over in 2002, was at the starting line to launch the race. He was reunited with Alex Fletcher, 23, who he allowed to run the race when he was 12 despite being underage. Mr Wiltshire said: “Alex was on my post route and wanted to raise money for the Thames Valley and Chiltern Air Ambulance. The event raised £9,000 for Goring Primary School but many competitors also ran for other charities. Damian Porter, from Caversham, helped to raise £3,500 for Hammer Out, a brain tumour charity, in memory of his sister-in-law Anna. She had already started raising funds after completing a 6k race despite losing the use of her right leg before she died six months ago from a brain tumour. Race director Graham Lunt said: “It was another great day in the Goring 10k history books, a good turnout of runners and spectators. 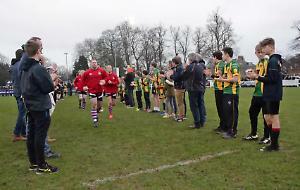 Very fitting for our 10th anniversary.” The Club at Mapledurham donated 1,000 bananas, which were handed out by Goring Primary School pupils, along with flapjacks provided by Pierrepont in Goring, at the finish line. The race was also sponsored by Warminghams, the Leatherne Bottel, Richard Wilson Long Solicitors, Huntswood, Swift Clik and Moti.